Murom (Russian: Муром, IPA: [ˈmurəm]; Old Norse: Moramar) is a historical city in Vladimir Oblast, Russia, which sprawls along the left bank of the Oka River. Population: 116,075 (2010 Census); 126,901 (2002 Census); 124,229 (1989 Census). In the 9th century CE, the city marked the easternmost settlement of the East Slavs in the land of the Finno-Ugric people called Muromians. The Primary Chronicle mentions it as early as 862. It is thus one of the oldest cities in Russia. Circa 900 CE, it was an important trading post from Volga Bulgaria to the Baltic Sea. Between 1010 and 1393, it was the capital of a separate principality, whose rulers included Saint Gleb, assassinated in 1015 and canonized in 1071, Saint Prince Konstantin the Blessed, and Saints Peter and Fevronia, subjects of an opera by Rimsky-Korsakov. It was believed to be the home town[dubious – discuss] of the most celebrated East Slavic epic hero, Ilya Muromets. The town has a statue which shows Ilya holding the hilt of his sword in the left hand and a cross in the right. Within the framework of administrative divisions, Murom serves as the administrative center of Muromsky District, even though it is not a part of it. As an administrative division, it is incorporated separately as the City of Murom—an administrative unit with the status equal to that of the districts. As a municipal division, the territory of the City of Murom together with nine rural localities in Muromsky District are incorporated as Murom Urban Okrug. The Trinity convent, where the relics of Sts. Peter and Fevronia are displayed, features a fine cathedral (1642–1643), Kazan church (1652), a bell-tower (1652), a wooden church of St. Sergius, and stone walls. It is rivaled by the Annunciation Monastery, founded in the reign of Ivan the Terrible to house the relics of local princes and containing a cathedral from 1664. Two last-mentioned cathedrals, being probably the works of the same masters, have much in common with the Resurrection Church (1658) in the downtown. Quite different is the tent-like church of Sts. Cosmas and Damian, built in 1565 on the bank of the Oka to commemorate the Russian conquest of Kazan. Among notable natives are the father of color photography, Sergey Prokudin-Gorsky (1863), the painter Ivan Kulikov(1875) and the father of television, Vladimir Zworykin (1888). ^ a b Государственный комитет Российской Федерации по статистике. Комитет Российской Федерации по стандартизации, метрологии и сертификации. №ОК 019-95 1 января 1997 г. «Общероссийский классификатор объектов административно-территориального деления. Код 17 244», в ред. изменения №278/2015 от 1 января 2016 г.. (State Statistics Committee of the Russian Federation. Committee of the Russian Federation on Standardization, Metrology, and Certification. #OK 019-95 January 1, 1997 Russian Classification of Objects of Administrative Division (OKATO). Code 17 244, as amended by the Amendment #278/2015 of January 1, 2016. ). ^ Hazzard Cross; Samuel and Sherbowitz-Wetzor; Olgerd P. (1953). The Russian Primary Chronicle: Laurentian Text (PDF). Medieval Academy of America, Cambridge, MA. pp. 59–60. ^ Kozlov, Vladimir A.; McClarnand MacKinnon, Elaine (2002). Mass uprisings in the USSR: protest and rebellion in the post-Stalin years. ISBN 9780765606686. Wikimedia Commons has media related to Murom. Законодательное Собрание Владимирской области. Закон №53-ОЗ от 11 мая 2005 г. «О наделении статусом городского округа муниципального образования округ Муром и установлении его границы», в ред. Закона №85-ОЗ от 12 октября 2011 г «О внесении изменений в Приложения 1 и 2 к Закону Владимирской области "О наделении статусом городского округа муниципального образования округ Муром и установлении его границы"». Вступил в силу 17 мая 2005 г. Опубликован: "Владимирские ведомости", №156–157, 17 мая 2005 г. (Legislative Assembly of Vladimir Oblast. Law #53-OZ of May 11, 2005 On Granting Urban Okrug Status to the Municipal Formation of the Okrug of Murom and on Establishing Its Border, as amended by the Law #85-OZ of October 12, 2011 On Amending Appendices 1 and 2 to the Law of Vladimir Oblast "On Granting Urban Okrug Status to the Municipal Formation of the Okrug of Murom and on Establishing Its Border". Effective as of May 17, 2005.). Законодательное Собрание Владимирской области. Закон №58-ОЗ от 13 мая 2005 г. «О наделении соответствующим статусом вновь образованного муниципального образования Муромский район и вновь образованных муниципальных образований, входящих в его состав, и установлении их границ», в ред. Закона №115-ОЗ от 10 августа 2009 г «О внесении изменений в Закон Владимирской области "О наделении соответствующим статусом вновь образованного муниципального образования Муромский район и вновь образованных муниципальных образований, входящих в его состав, и установлении их границ"». Вступил в силу со дня официального опубликования (18 мая 2005 г.). Опубликован: "Владимирские ведомости", №№158–165, 18 мая 2005 г. (Legislative Assembly of Vladimir Oblast. Law #58-OZ of May 13, 2005 On Granting an Appropriate Status to the Newly Established Municipal Formation of Muromsky District and to the Newly Established Municipal Formations Which Comprise It, and on Establishing Their Borders, as amended by the Law #115-OZ of August 10, 2009 On Amending the Law of Vladimir Oblast "On Granting an Appropriate Status to the Newly Established Municipal Formation of Muromsky District and to the Newly Established Municipal Formations Which Comprise It, and on Establishing Their Borders". Effective as of the day of the official publication (May 18, 2005).). Alexandrovsky District is an administrative and municipal district (raion), one of the sixteen in Vladimir Oblast, Russia. It is located in the west of the oblast. The area of the district is 1,834 square kilometers (708 sq mi). Its administrative center is the town of Alexandrov. Population: 113,900 (2010 Census); 55,207 ; 26,258 (1989 Census). The population of Alexandrov accounts for 54.0% of the total district's population. Gorokhovetsky District is an administrative and municipal district (raion), one of the sixteen in Vladimir Oblast, Russia. It is located in the east of the oblast. The area of the district is 1,487 square kilometers (574 sq mi). Its administrative center is the town of Gorokhovets. Population: 22,923 (2010 Census); 25,832 ; 30,156 (1989 Census). 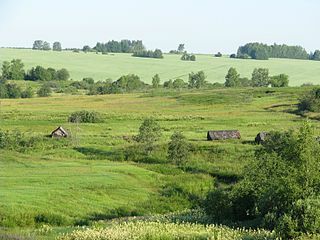 The population of Gorokhovets accounts for 61.1% of the district's total population. Kameshkovsky District is an administrative and municipal district (raion), one of the sixteen in Vladimir Oblast, Russia. It is located in the north of the oblast. The area of the district is 1,090 square kilometers (420 sq mi). Its administrative center is the town of Kameshkovo. Population: 30,466 (2010 Census); 37,961 ; 42,298 (1989 Census). The population of Kameshkovo accounts for 43.0% of the district's total population. Kolchuginsky District is an administrative and municipal district (raion), one of the sixteen in Vladimir Oblast, Russia. It is located in the west of the oblast. The area of the district is 1,148 square kilometers (443 sq mi). Its administrative center is the town of Kolchugino. Population: 56,351 (2010 Census); 11,405 ; 16,312 (1989 Census). The population of Kolchugino accounts for 81.2% of the district's total population. Melenkovsky District is an administrative and municipal district (raion), one of the sixteen in Vladimir Oblast, Russia. It is located in the southeast of the oblast. The area of the district is 2,221 square kilometers (858 sq mi). Its administrative center is the town of Melenki. Population: 36,464 (2010 Census); 41,125 ; 49,712 (1989 Census). The population of Melenki accounts for 41.7% of the district's total population. Selivanovsky District is an administrative and municipal district (raion), one of the sixteen in Vladimir Oblast, Russia. It is located in the east of the oblast. The area of the district is 1,388 square kilometers (536 sq mi). Its administrative center is the urban locality of Krasnaya Gorbatka. Population: 18,610 (2010 Census); 21,330 ; 24,767 (1989 Census). The population of Krasnaya Gorbatka accounts for 47.7% of the district's total population. Sudogodsky District is an administrative and municipal district (raion), one of the sixteen in Vladimir Oblast, Russia. It is located in the center of the oblast. The area of the district is 1,616 square kilometers (624 sq mi). Its administrative center is the town of Sudogda. Population: 41,177 (2010 Census); 44,429 ; 45,946 (1989 Census). The population of Sudogda accounts for 28.8% of the district's total population. Vyaznikovsky District is an administrative and municipal district (raion), one of the sixteen in Vladimir Oblast, Russia. It is located in the northeast of the oblast. The area of the district is 2,252 square kilometers (870 sq mi). Its administrative center is the town of Vyazniki. Population: 80,987 (2010 Census); 50,692 ; 60,262 (1989 Census). The population of Vyazniki accounts for 50.9% of the district's total population.